By the process of rolling, material of another material was brought in into the surface of the rod wire. 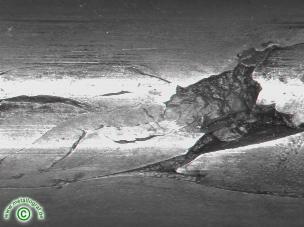 This defect is very rare and can be aroused by maintenance or repair work. In this case the fragment of a broken bearing has been overlooked at the repair. At a later time, this piece has been taken on the rolled piece and has pressed himself in into the surface. 1.3505 (anti-friction bearing steel) was stated at an analysis of the foreign material.